Hard to believe another year has gone by so quickly. Sometimes I feel like I'm on the Tilt-a-whirl ad I can't get off. Before I now it, it will be Spring break, then Summer vacation. I'm trying to enjoy every last minute of my Winter Break- of course it isn't all fun and games. There is a lot of house cleaning going on and as many of you know I'm getting ready to send my oldest off to to college. She is a mid semester junior transfer. The list of necessities seems to grow by the minute. So far this week I've had to buy her a new bed, bookcase, shower curtain, bedroom curtain, shelf liner and some cleaning supplies. We still need a bath rug, a lock for her door and well I suppose she will need some food too. Oh, and she is taking my living room sofa, which means I will need a new one. All I can say is I'm thankful for TpT. It has given me the ability to send my kid off to school without having to worry about the finances. Next year I will have two in college, as my son is a Senior. If you've ever had a kid in high school, you know how pricey it can be. Ok, enough about me and my family, how about some new things for the new year. 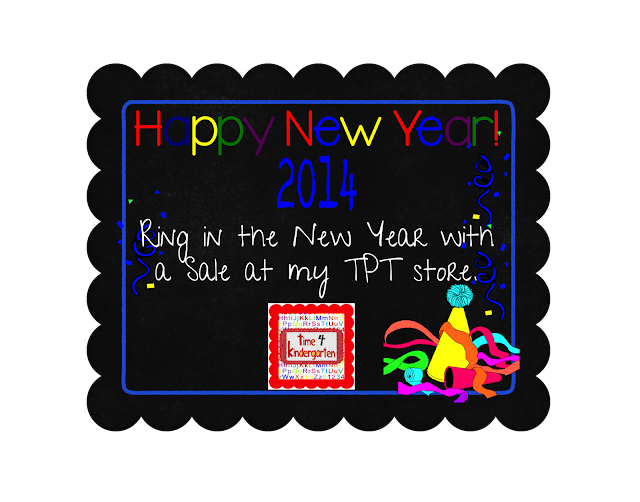 Do you follow me on TPT? If not, you should. I will be sending out a Freebie to my followers in the next few days. Also, make sure you follow my blog and my FB page. I like to give Freebies there too. My goal for the 2014 year is to blog more, create more, and learn to use instagram more. You can follow me there @time4kindergarten. To ring in the New Year, I'm throwing a sale! When the clock stirkes midnight, the sale will be done, don't miss out on all the fun! Happy New Year, Tiffany! Wishing you all the best, and thanking you for your hard work and creativity. You inspire me to be a better teacher!! :) Blessings to you and your family. Robin, Thanks so much for the sweat message. It made my day!